When planning a trip to Carolina Beach the first thing that comes to mind may be sunbathing and swimming, but with over 300 miles of coastline North Carolina is a dream for scuba and wreck divers. 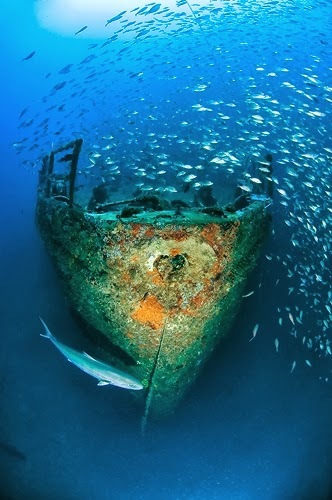 It is unknown how many ship wrecks lie off the Cape Fear Coast, but there are at least one hundred that are popular with divers of all levels. Many of these wrecks were caused by the treacherous waters of the Gulf Stream current and shifting sandbars while others were casualties of World War II and the Civil War. Sunken beneath our waters you can explore United States and British Naval ships, German U-Boats and various merchant ships. The Normannia was a freighter that sunk in 1924 on its way from Jamaica to South Carolina. This wreck is a picturesque dive full of colorful, tropical fish, sea turtles, schools of rays and lobsters. The tanker ship Cassimir met its end in 1942 when it collided with the SS Lara on a foggy night. In addition to the typical marine life of this area divers of this wreck have seen angelfish, African pompano and hogfish. A fun dive for beginners is the Liberty Ship. The actual name of this ship is the Theodore Parker. Originally built in 1943, the Theodore Parker made several crossings between England and the United States during World War II carrying food and materials for the war. This ship was purchased by the state of North Carolina as part of the artificial reef program and was sunk in 1974. Divers of this wreck can expect to see sea bass, sheephead and spadefish. The Lobster Wreck is somewhat shrouded in mystery and little is known about the ship. Only since 2002 has it been confirmed that this dredge was originally known as the Porta Allegra built around 1908. This wreck abounds with lobsters, angel fish and beautiful lion fish. These are just a few of the interesting dives that can be taken when visiting Carolina Beach and Wilmington. The scuba diving companies in our area run tours year round making it a great reason to plan a trip to the coast in the off season when our beaches are no longer crowded and room rates drop. At the Beacon House we are happy to assist you in making arrangements with any of our local dive companies. If you would like to do some personal research you may want to have a look at Aqua Safaris and Divers’ Emporium, Scuba Now or North Carolina Wreckdiving. We look forward to having you visit us soon and enjoy the adventure of scuba diving at the Cape Fear Coast and the Graveyard of the Atlantic. This entry was posted in Carolina Beach, diving, Fall Events by admin. Bookmark the permalink.